You see those pretty blue mitts? 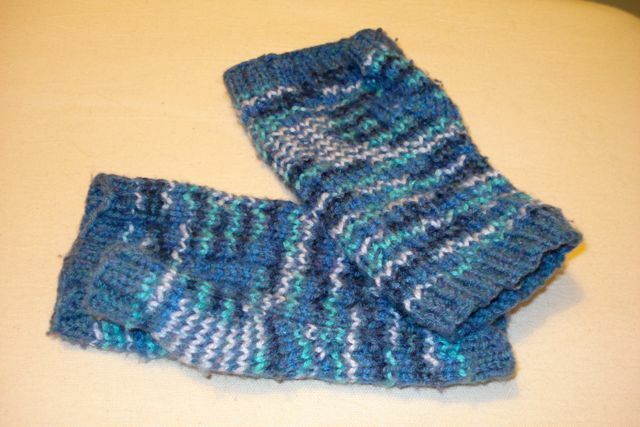 They’re knitted with acrylic yarn to Twinset Ellen’s pattern and were originally intended for me. But the pair I’d made for YoungB having stretched so much they were almost too big for Dr B, the blue pair – logically and obviously – went to a worthier home. Cheap and acrylic though the yarn might be, it’s wearing well and still keeping YoungB’s hands warm in Italy. You might recall I said I’d been doing a reasonable amount of crochet and knitting while my computer was not working. 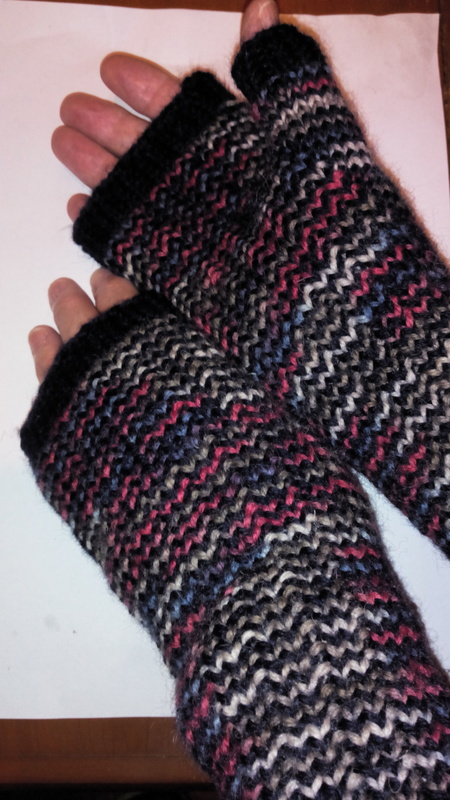 One such item was this pair of fingerless mitts for a work colleague. They started out a couple of years ago as a birthday present for someone else but plans changed – as they so often do – and the mitts languished, awaiting their moment. I’ve often said I don’t frog projects when they come to a grinding halt, just put them away for a while, which sometimes works in my favour if I need something in a hurry. The building where I work has airconditioning that’s unpredictably crazy, but errs on the side of glacial most of the year. When birthday presents were mentioned, mitts seemed a sensible notion and these fitted the bill in many ways, mostly that they were about 50% done, the colours were right and I had a couple of weekends available for knitting the remainder, weaving in the surprisingly large number of ends and allowing plenty of time for blocking; or so I thought. I’ve said before that I don’t make resolutions with and for new years and that I don’t really have defined plans for what I might knit during any year. Of course, there are things I have an idea I’ll get around to doing, anual goals I might achieve such as birthday knitting – YoungB’s new jumper comes into that category; but he’s having second thoughts about which design he’d like, hence it’s already stalled! – and others that I wouldn’t have foreseen in any planning – cousins with cancer and jungle-themed birthday parties might come into that category in terms of unexpectedness – but which require my doing something. Well, to me they do. Others might do different things but I suppose my response to bad times as well as good tends to be handmade gifts: mitts when Youngest Aunt had a heart attack; a moebius cowl for a friend when her mother died; a cowl and bandanna for the cousin. It’s what I do and I think it’s too late in life to try to change my habits, at least in that respect. Then there are all those serendipitous little things that happen along – new babies in the family and so on – and other things that you decide on a whim you’ll make. Today’s plea for assistance relates to an item in the whimsical category. One of YoungB’s mates is turning 21 soon. Her party takes place at the same time as the family’s jungle-themed one so YoungB won’t be here. However, he’ll certainly catch up with both birthday girls at some point. 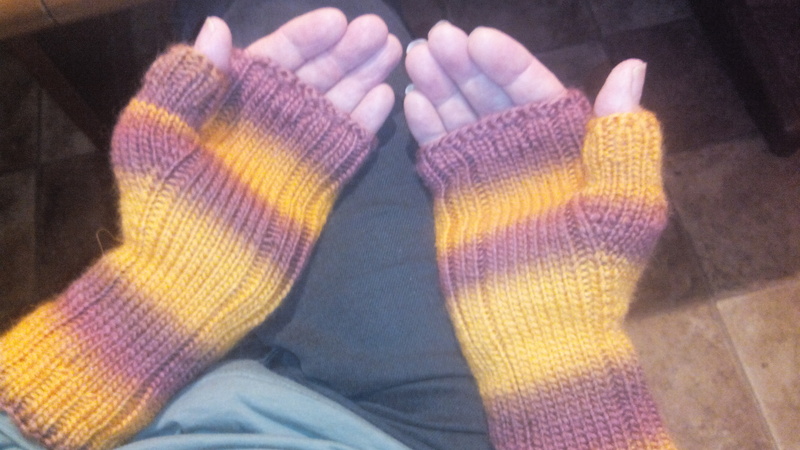 I offered to knit some fingerless mitts for the friend. She’s also a scientist and her fingers would get cold in winter, too, and handknitted, woollen, fingerless mitts would be a wonderful, impossible to replicate gift (well, I suppose they might be found somewhere if you knew where to look, but not at prices affordable by an impoverished uni student; as if there’s any other sort). Lincraft‘s Hand-Dyed Effect (in either of the Rock Garden or Regal colourways to capitalise on the blue favoured by the birthday girl) might be a good substitute but it’s considerably dearer and its quality unknown even though the fibre composition is similar to the Bendigo yarn. There’s a shop in town that sells Noro yarns so I could pick up some sock yarn when I’m in that vicinity (employment agency interviews and things of that sort invariably happen in town). I love the unexpectedness of Noro’s colourways but suspect they also might be too strong for the subtlety of the Hedgerow pattern. In addition to the financial consideration, there’s a time constraint, too, and it’s quite pressing, so I need to find something suitable immediately if not sooner. Yesterday would have been good! Or, of course, if this gets all too difficult and headache-inducing, I could use a different mitt pattern. There’s no shortage of those, I know, or I could stick to this designer’s work that I keep coming back to (and of which I’ve made a goodly number of pairs and they’re all lovely). But the Hedgerow one is lovely, too, in a different way; and a 21st birthday is a special occasion. So if you have any yarn substitution suggestions, I’d be forever grateful. Thank you.